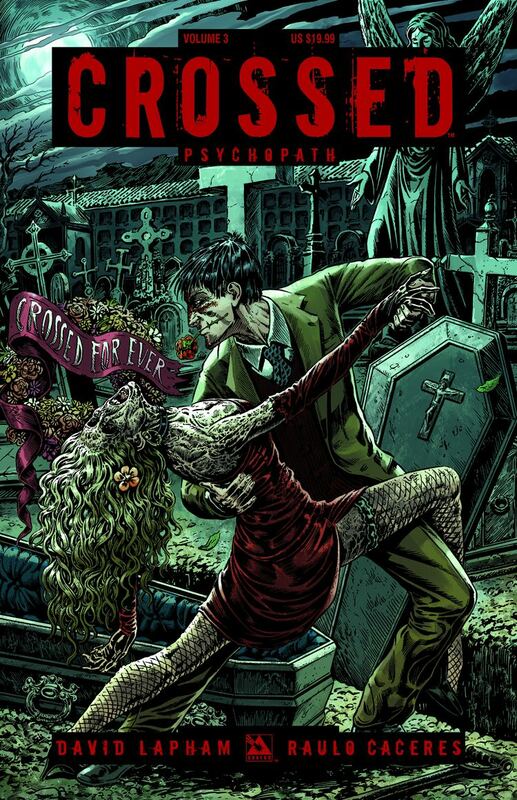 The long-awaited third volume of Crossed is finally here, collecting all seven issues of the Psychopath series by David Lapham and artist Raulo Caceres! In one terrifying moment, civilization crumbled. An outbreak of insanity swept across the planet, turning millions of people into the scarred homicidal maniacs known as "the Crossed." For one small band of survivors, the discovery of a starving, injured man in the desert seems like an unexpected blessing. He knows where they could be safe: the location of the last holdout of the scientific community, where the military offers protection and the cure to the Crossed plague is being developed. But Harold Lorre is not the savior they hope him to be. He's a calculating, lethal man whose mind was dangerously unhinged even before the world went mad. Surrounded by marauding hordes, their nerves shattered by unending fear, the group fall victim to the manipulations and deadly perversions of a psychopath. Writer David Lapham, the critically acclaimed creator of Stray Bullets, returns to the universe of Crossed with a descent into evil so far beyond what you could possibly imagine. Available in three editions: as a TPB or Hardcover with new covers by series artist Raulo Caceres and also a Signed Hardcover, with a new Caceres cover, signed by writer David Lapham and limited to just 1000 copies!